Jean-Antoine Houdon, Versailles 1741 – 1828 Paris. Benjamin Franklin, ca. 1786. Plaster, painted terracotta color, 33 1/8 x 26 ¼ x 16 3/16 in. Gift of the estate of George Francis Parkman, 1908 [?]. For both its aesthetic brilliance and impeccable provenance, Houdon’s bust of the Marquis de Lafayette is one of the brightest stars of the Boston Athenæum’s collection. 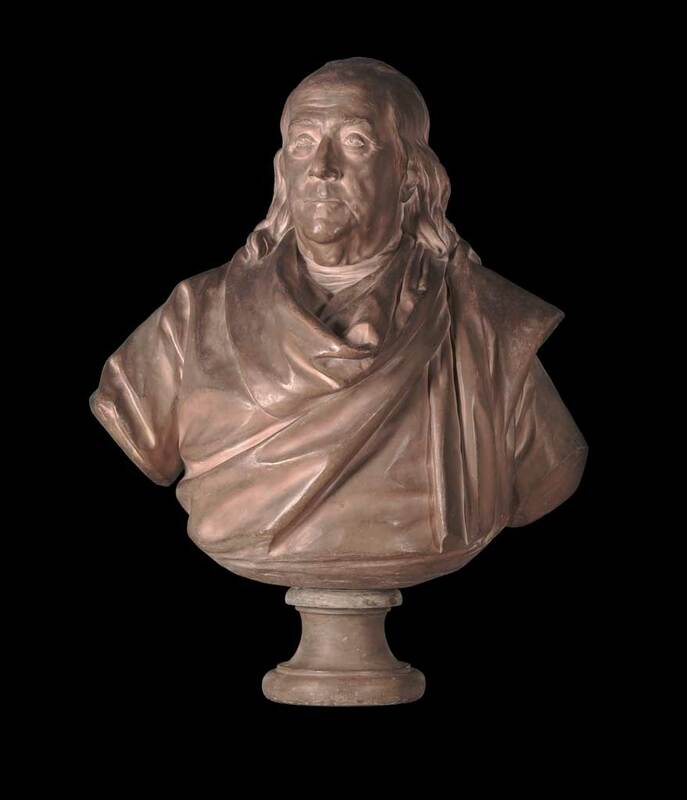 Although its provenance is less straightforward than that of the Marquis, the bust of Benjamin Franklin follows closely behind, showing off the original, painted surface of terracotta color revealed through recent conservation. The Athenæum’s collection also includes a plaster bust of George Washington by Houdon; Lafayette, Washington – and possibly Franklin – came from Thomas Jefferson’s Monticello. The bust of Lafayette was acquired by Jefferson directly from Houdon in Paris in 1789 and was part of a large shipment of Jefferson’s French acquisitions of furniture, paintings, prints, and sculpture, including several other plaster busts by Houdon. At Monticello, Jefferson placed this bust of Lafayette in the polygonal Tea Room—his “gallery of worthies”—along with three other Houdon portraits of great men and friends: George Washington, Benjamin Franklin, and John Paul Jones. Upon Jefferson’s death in 1826, the four busts descended to Joseph Coolidge, Jr., of Boston, who had married Jefferson’s granddaughter, Ellen Randolph. On March 11, 1828, Coolidge deposited at the Athenæum the busts of Washington, Franklin, and Jones, all by Houdon, prior to the sale of Jefferson’s effects by Coolidge at the Athenæum that summer. Surprisingly, the sale proved dismal. Some months later, Houdon’s bust of the Marquis de Lafayette was added to the other three already at the Athenæum, but the Trustees purchased only Lafayette from Coolidge for $100. The other three were left at the Athenæum until the ownership was officially transferred to the Library in 1908. Jean-Antoine Houdon,Versailles 1741 – 1828 Paris. Marquis de Lafayette, before 1789. Plaster, painted white over the original terracotta-color paint, 29 7/16 x 20 1/16 x 19 ¾ in. Born into an ancient noble family in France, the Marquis de Lafayette (1757-1834) was a lifelong champion of the cause of liberty and a celebrated hero of both the French and American Revolutions. In 1776, when not yet twenty years old, he sailed clandestinely to America to offer his services to George Washington, whose brilliant second-in-command he would be until the victory at Yorktown ensured the independence of the United States. He was a trusted friend to many major American participants of the War of Independence, and a particularly close one to Jefferson. Lafayette returned to America in 1780 and, being charged with the defense of Virginia, played a large role in bringing about the surrender of Cornwallis at Yorktown in October 1781. In gratitude, the Virginia legislature voted to commission two busts of Lafayette, one for the city of Paris and the other for the state, and on Jefferson’s recommendation Houdon was chosen. Jean-Antoine Houdon (1741-1828) is generally considered the foremost European sculptor in the age of Enlightenment. Having trained in Paris and Rome in the 1760s, he created likenesses of striking immediacy. His illustrious sitters included kings, princes, the rich, and the powerful, as well as major figures in the arts such as Diderot, Voltaire, and Rousseau. By the early 1780s Houdon’s reputation was solidly established, but his lifelong ambition to create a life-size equestrian statue remained unfulfilled. To the delight of the ambitious sculptor, the American Congress resolved to erect a monument to George Washington and chose Houdon for the task, again on Jefferson’s recommendation. Houdon sailed to America in 1785 (aboard the same ship as Franklin) to model General Washington and spent over two weeks at Mt. Vernon, taking a life mask of Washington’s face and making a clay model of his head. Although the equestrian project was eventually abandoned, Houdon was commissioned to make a marble, pedestrian statue of Washington for the State Capitol in Richmond in 1796. The statue was widely admired, and in 1847 the Athenæum sent the Boston plaster artist Francesco Cecchi to take a plaster cast of this statue in Richmond; the cast is still in the Athenæum’s collection. When he made a portrait bust, Houdon modeled first in clay from the sitter. This clay model, to modern thinking an “original” work of art, was only used to make a plaster mold and was afterwards discarded. Houdon attached little importance to the clay model, for it was from the mold that he would make subsequent versions in plaster, terracotta, marble, or bronze, according to the customer’s choice of medium. Houdon was a perfectionist as a craftsman and every bust that left his studio is said to have received his own attention in the final finishing. The busts that were made from the molds in Houdon’s studio are therefore properly considered “originals,” and the Athenæum’s busts all fall into this category. Before he set sail for America in the summer of 1785, Houdon took a life mask of the twenty-eight-year-old Marquis de Lafayette in Paris. Using the life mask as a model, Houdon made a marble bust of the Marquis for the city of Paris (unlocated) and a similar bust for the Virginia State Capitol in Richmond, both in 1786. The date for the Athenæum’s bust is not known (hence “before 1789,” when Jefferson purchased it from Houdon), but it is particularly close in modeling to the life mask. The face of the Athenæum’s bust bears a moving—and more convincing—resemblance to the life mask than does the Richmond marble, and without the drapery that encircles the latter over the uniform of the American revolutionary army. More truncated and simpler in format, the Athenæum’s bust is all the more forceful, capturing the irrepressible pride and idealism of the young hero. It shows Houdon at his best, and is the only original example of this version known to exist. When this bust left Houdon’s studio in 1789, it was painted a terracotta color. Houdon regularly painted his plaster sculpture with shades of brown to simulate terracotta or bronze. When Jefferson sent this and other busts from Paris to America, the shipment included vials of touch-up paint, presumably of different shades of brown, for use on the plaster busts. In the course of two centuries, however, several coats of white paint were applied to its surface to freshen up its appearance, a common practice in American collections. The bust has lost the crispness of the original modeling by Houdon, and awaits the future development of a technique that will safely remove the disfiguring white paint layers. The bust of Benjamin Franklin by Houdon, on the other hand, has beautifully revealed the original painted surface intended by the sculptor through recent conservation. The brown color, with a distinct patina, is very similar to that on the bust of Diderot by Houdon at the Nationalmuseum in Stockholm, and gives us visual evidence of late eighteenth-century taste. Benjamin Franklin (1706-1790) was the American minister to the court of Louis XVI from 1776 to 1785. Houdon was one of the many artists who portrayed the famous American, making at least two versions of his bust. An earlier version, smaller and in contemporary dress, was displayed in Houdon’s Studio by 1778 and appeared at the Salon of 1779. Houdon created the bust without commission—Franklin was so popular the bust was sure to sell—but it is not known if Franklin ever sat for Houdon. Examples of this famous version (with variations) are many. Wearing a plain suit and a neckcloth, Franklin is depicted in this smaller version with slightly parted lips as if in mid-sentence, with the contemplative gaze that is made all the more intense by the small size of the torso and the relative lack of detail in coiffure and dress. The Athenæum’s bust is of the second, less ubiquitous type, with voluminous drapery wrapped around Franklin’s contemporary dress. Only one other example of this version is known. Monumental in scale, the later composition, perhaps slightly less successful aesthetically than that of the earlier type, depicts the diplomat with a degree of swagger absent in the earlier version and projects the palpable, orchestral grandeur with which Houdon endowed his best portraits. Hina Hirayama from, Stanley Ellis Cushing and David B. Dearinger, eds., Acquired Tastes: 200 Years of Collecting for the Boston Athenæum (2006): 261-265. Copyright © The Boston Athenæum. For Jefferson’s purchases in France and their placements at Monticello, see Susan R. Stein, The Worlds of Thomas Jefferson at Monticello (New York: Harry N. Abrams, 1993). From the sale the Athenæum purchased for $200 a portrait of Benjamin Franklin, then attributed to Greuze and now considered a copy after Duplessis, now at Monticello. That was the only painting sold from the 1828 sale, and most of its contents was offered again for sale at Chester Harding’s Gallery in 1833. The Virginia legislature voted twice: the first vote in 1781 resolved that a bust of the Marquis be made and presented to him, and the second vote in 1784 stipulated two busts to be made, one for the city of Paris (rather than the Marquis) and the other for the state of Virginia. On Houdon, see Anne L. Poulet, et al., Jean-Antoine Houdon: Sculptor of the Enlightenment (Washington, D. C.: National Gallery of Art, 2003); and H. Harvard Arnason, The Sculptures of Houdon (New York: Oxford University Press, 1975). The life mask is now at the Pierpont Morgan Library, New York, and the clay model at Mt. Vernon. The life mask, now in the collection of the Herbert F. Johnson Museum of Art, Cornell University, is reproduced in Poulet, 258 and 262. For thorough and accurate description of the Athenæum’s bust of Lafayette, see also Poulet, 256-262. In 1790 Houdon produced another bust of Lafayette, wearing a formal wig and the uniform of the French National Guard, but it shows a face considerably more aged. Another example of the plaster bust is in the collection of Girard College, Philadelphia. Stein, 215. Tests conducted during recent conservation of the bust confirm the painted terracotta color of the original surface. The bust of Diderot is reproduced in Poulet, 145. See Charles Coleman Sellers, Benjamin Franklin in Portraiture (New Haven & London: Yale University Press, 1962). For a description of the earlier version, see Poulet, 246-250. The other example is at the Musée des Beaux-Arts, Angers, France.